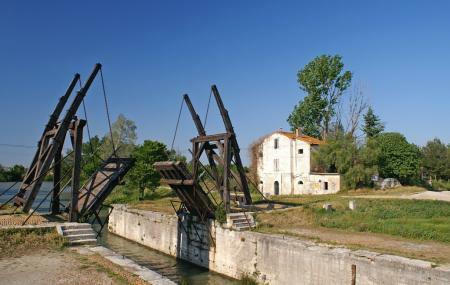 The Pont de Langlois or the Langlois Bridge was constructed in the first half of the 19th century as one of the crossings over the Arles to Bouc Canal. In 1930, the original drawbridge was reinforced by concrete. But sadly, just 14 years later, it was blown up by the Germans along with all other bridges at the canal. The Pont de Langlois is also famous as the Pont de Van Gogh. The city of Arles has been pretty enamoured by the great artists and for good reason. Like many places in Arles, the Pont de Langlois too has been an inspiration to Vincent Van Gogh, who produced 9 artworks – 4 oil paintings, one watercolour, and 4 drawings –of the site in 1888. After its destruction in 1944, the bridge was reconstructed to recognize the works of the artist. Today, a lot of art enthusiasts visit the drawbridge to pay their respects to the painter. It is a wonderful location to spend an evening appreciating Van Gogh’s art and inspiration. How popular is Pont De Van Gogh? People normally club together Moulin De Daudet and Eglise And Cloitre St-trophime while planning their visit to Pont De Van Gogh. People also prefer to start their day with Pont De Van Gogh. Almost as I imagined it! Rode past here while doing the ViaRhona. There is a copy of VanGogh's painting to see how it appeared in his time (1888). The bridge has not changed since and it's nice to compare the then to the now. There is a more modern bridge next to it that many people take photos from. Worth a visit if you're in the area and an art buff. Very pretty area with a touh of art history. Not too many people even on weekends. It must have something to do with the lack of facilities. No toilet but there's a gas station on the way out. A pleasant walk from the centre of Arles. Be careful of slums and a misleading map given out by the tourism office.